Like many designs, inventions, and advances in the history of firearms, a bolt as a part of a firearm has also passed long way in its evolution. The first appearance of a bolt-action system was recorded in the early 19th century in the form of breech loading rifles such as the Dreyse needle gun. In this review article, we’re going to take a look at some of the best bottom carrier groups (BCG) for your AR-10. For each product on our list, we’ll be taking a look at some pros and cons, as well as outlining their main features. Beforehand, we’ll be providing some general information related to what a BCG is and how it works. What is the Bolt Carrier Group (BCG) and How Does it Work? Nowadays, firing systems demand more complex and sophisticated bolt units. In AR-15’s, the bolt and its carrier are a primary functioning part, a lifeline of your rifle, and the part that moves the most. Actually, the heart of the AR platform rifles is Bolt Carrier Group or for BCG for short. It’s full of moving parts; more precisely, it consists of 6 main components: retaining pin, bolt cam pin, gas key, bolt assembly, carrier and firing pin. In total, seventeen parts comprising the bolt carrier group. With all AR-15/AR10s and other AR-style guns, the BCG is located between the upper and lower receiver and while enduring extreme temperatures and pressures it reliably performs three functions - cycling, ejection, and reloading, or in plain words, BCG has to fire a cartridge, load a new one and expel the empty case, all by itself. What Makes a Top Choice for a BCG? Until recently, aftermarket parts offered for AR-15 parts and accessories was dominant, but today, the situation is completely changed because of the sheer volume of companies offering AR .308 parts. There are many different types of BCGs, all with many different characteristics. 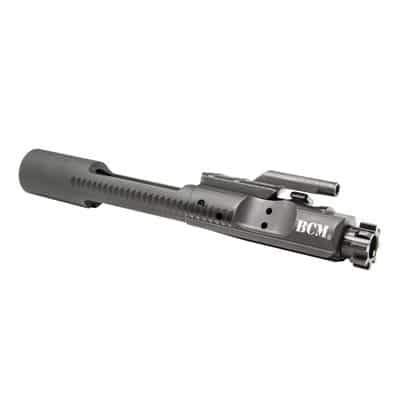 If you are looking for the best AR-10 BCG, you will need to be familiar with phrases like Full-Auto Bolt Carrier Group, or the variety of material types, and acronyms like HPT and MPI. Therefore, we will try to decrypt that strange language of bolt carrier groups and make an effort to clarify one of the most confusing aspects in AR world, improving a .308 Bolt Carrier Group. Since there is no mil-spec standard in .308-bolt carrier group, as you have likely seen in the AR-15 family, the first thing to know is that there are a multiple incompatible .308-bolt carrier group designs. According to this, you can only use an AR-10 BCG in an Armalite AR-10 Rifle, and DPMS LR-308 BCG in .308 rifles based on the DPMS .308 platform. However, there are several other designs, but these two are the most common in the hardware section called .308 Bolt Carrier Group. Along these limitations, it is not recommended to use one BCG in more than one rifle, since the bolt and barrel extension contacting surfaces wear together during exploitation, making themselves unique. In general, there are two common BCG profiles: semi-auto and full-auto. Although the choice of "semi-auto" or “full auto” (SA or FA) refers to the intended use of the bolt carrier group, an FA or M16 style BCG is more in demand due to its versatility and shrouded firing pin. The shrouded pin ensures the carrier can take the force and apply it evenly to the hammer after every round. By contrast, an unshrouded firing pin triggers excessive wear on both the hammer and firing pin, which can easily break your firing pin with hard use. The difference is in the bolt`s carrier itself, as a full auto carrier has a little more material on the back compared to semi-auto BCGs. As previously mentioned, semi-auto (SA) carriers weigh less than FA carriers. Also, due to the cutback at the rear portion, semi-auto carriers can use a lighter buffer, which results in even more weight savings if you’re building your own AR-10 style rifle. Besides that, the low mass of semi-auto bolt carrier groups has their benefits such as minor recoil and somewhat increased rate of fire. On another note, the full auto (FA) BCG has more weight than stock AR-15 BCG and offers more consistent reliability and function in your rifle due to the greater mass. Another feature to look to is the material of BCG. Because the BCG faces a lot of heat and stress, it should be perfectly machined to deliver optimum performance. Good old-fashioned steel is the classic choice for the construction of this piece of metal that slides back and forth with each shot. The most common steels for manufacturing BCGs are Carpenter 158 and 9310 steel used for the bolt, while the carrier is built from 8620 steel. However, the BCGs made of aluminum, titanium, and hybrid mixture of those three elements are also available on the market. Besides flawlessly machined bolts and other parts, the finish of BCG is a critical feature. 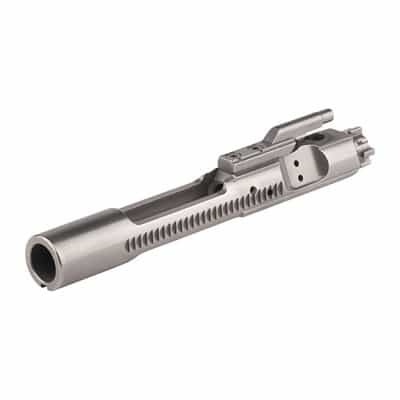 Practically the coating of the bolt carrier group affects its ability to resist heat and corrosion, and determines how it will operate. There are a multitude of finishes, but for most builds, a Mil-Spec, phosphate coated BCG is the standard. It offers an economical, durable, and highly corrosion resistance. Since the surface is more porous, it is quite susceptible to fouling and a bit challenging to clean. For years, a hard chrome finish was an excellent alternative, but it has lost some popularity with the rise of newer coating technologies. While the manganese phosphate coating is the standard finish on most “regular” BCGs, the newer coatings generally are more durable, require less lube to run smoothly, and they often cost 2 or 3 times the price of phosphate coated BCG. According to Mil-Spec requirements, the interior of the bolt carrier and the gas key must be chrome-lined to provide a smoother and corrosion resistant surface on the inside. Assuming that every quality made BCG has undergone heat treatment, it should also be treated through shot peening process. This involves tiny spheres known as "shot", which are blasted at the bolt to relieve stress from the metal. Now we’re going to transition into the review section of our article and take a look at a few products that made our list. For each BCG, we’re going to discuss their main features and then see the pros and cons. Let’s get started! DPMS 308 AR Bolt Carrier Groups remains the most common .308 BCG’s available groups that dominate the .308 AR rifle platform. DPMS LR-308, a shot peened bolt, is machined of Carpenter 158 steel alloy and carrier of 8620 carbon steel. The carrier is chrome lined and available with either a mil-spec phosphate coating or hard chrome finish. The complete AR-style .308 bolt and carrier comes with gas key installed and staked. DPMS assembly consists of the bolt carrier, the gas key, the gas rings, the bolt assembly, the ejector, the extractor, the cam pin, the retaining pin and the firing pin. The most frequent customer’s complaints refer to finish with noticeable traces of machining process and very tight fit between the BCGs and uppers, which prevents cycling. DPMS genuine factory replacement is the closest unit we have to a “standard”. The eye-catching difference is the absence of Forward Assist serrations since the forward assist engages a shoulder on the carrier still forcing the bolt forward when needed. JP is one of the first AR-parts manufacturers starting to produce lightweight BCG models. 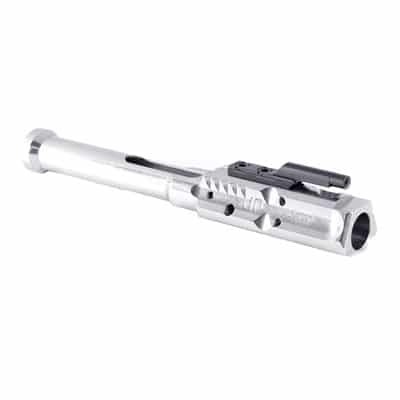 The JP Low Mass bolt carrier assembly is made from SAE 9310 stainless steel and treated with chromium nitride. Considering this unit is made of steel, it owes its low mass to reduced-weight cuts without sacrificing strength. The JP lightweight carrier comes with extra bearing surfaces to enhance bolt alignment, reduce wear and allows for a lighter recoil impulse. The customers who buy this model need to keep in mind that lightweight bolt carriers have significantly lower reciprocating mass than standard Mil-Spec carriers and need to be used with an adjustable gas block for less gas flow and softer recoil. You will notice that forward assist serrations are not included on JP Low mass carrier, but since this model is only used in rifles that are meant for competitions, this feature will not be missed. When used with other JP hardware, this BCG works like a Swiss watch, making an impression of firing more like a .22 than a centerfire rifle. The JP, low-mass BCG is designed to upgrade any JP or DPMS or Remington AR-style .308 rifle (LR-308 pattern only) especially if you plan to shoot competition or heavy use. 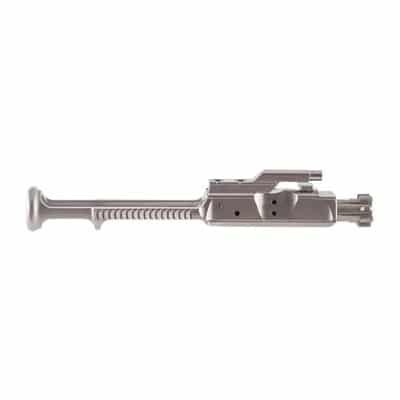 Complete CMMG`s bolt carrier assembly includes bolt, bolt carrier with the adequately staked gas key, cam pin, stainless steel firing pin, and retaining pin. The CMMG bolt is built from 9310 steel, the carrier is machined from 8620 steel with the chrome lined interior, while the extractor is made of hardened S7 tool steel. All components feature a durable, Phosphate matte black finish. Both bolt and bolt carrier are Magnetic Particle tested and Shot Peened. Like some other counterparts, CMMG BCG comes without serrations for a forward assist. The bolt/carrier group from CMMG is ready to drop into your .308 rifle based on LR308 Platform. Although it does not have the smooth fitting feel of other bolt assemblies, it’s made under the standard that is most-widely-used for bolt carrier groups. With the release of the new lightweight bolt carrier, Brownells has joined the trend of low mass BCGs purpose-built for AR-15 competitors. 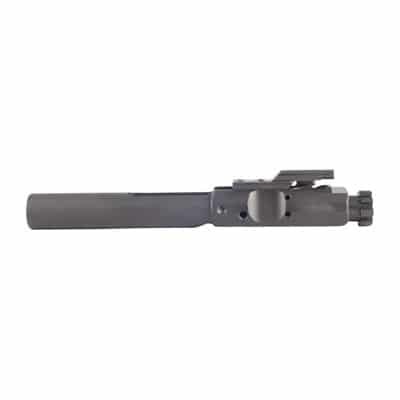 While the heavy-duty bolt itself is a standard model using 9310-tool steel, the bolt carrier is machined from hardened 8620 steel and lightened by cutting out the material, leaving just enough to make it functional. The Brownells M16 Lightweight BCG comes fully assembled with a properly torqued and staked gas key, and features the necessary black insert and O-ring around the extractor. Unlike some other lightweight BCGs, the Brownell has retained the forward assist notches. All components are magnetic particle inspected (MPI) and after machining, heat-treated and shot peened to ensure quality and reliability. This lightweight bolt carrier group comes in three flavors of black nitride, titanium nitride (TiN) or nickel boron finishes. The Brownells BCG is compatible with 5.56x45 NATO, .223 Rem., .300 Blackout, and .204 Ruger calibers. At a weight of only 8.2 ounces, this low mass assembly is light enough to decrease the overall weight of a lightweight AR build and reduce the felt recoil of any AR-style firearm. Undoubtedly, Bravo Company Manufacturing (BCM) M16 5.56 BCG is one of the best selling and most popular AR-15 bolt carrier groups. Without unnecessary exotic coatings or any other less proven gimmicks, it entirely satisfies different necessities and shooting styles. 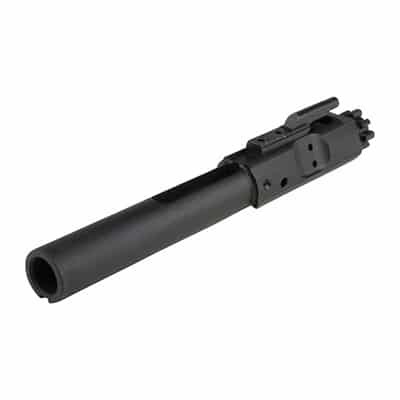 Bravo Company is offering a fully assembled Bolt Carrier Group with a parkerized exterior. The carrier and gas key has a chrome-lined interior, the bolt assembly is made from the Mil-Spec Carpenter No. 158 steel, and the extractor spring is made of tool steel. As a standard, the BCM BCGs are staked with grade 8 hardened fasteners, particle tested (MPI), and are heat-treated (HPT) for more durability. Following machining, the bolt is shot peened for increased strength and high heat resistance. Furthermore, each unit is thoroughly test fired for function before being shipped, so chances are you might spot handling marks on them as well. Although Bravo unit is primarily built for first service semi-automatic rifles, this BCG features full auto profile, which means it is compatible with fully automatic rifles too. Knowing that the US Navy, US Marines, and the SOCOM are on the Bravo list of clients, you can be assured BCM bolt would make a great addition to your AR-15. WMD Guns is a leader in coating technologies, and their BCG with proprietary NiB-X nickel boron coating will allow extremely extended period between cleaning cycles. By supporting traditional form, this BCG features full forward assist teeth, a properly staked gas key, M-16 cut, and classic profile. The WMD assembly utilizes the massive M16 Full Auto carrier, which will function in any semi-automatic AR-15 rifle. The carrier body is constructed of case hardened 8620 and it’s hardened extractor features the next-generation NiB-X Nickel Boron coating, which offers 40% greater wear life than Mil-Spec coating. The bolt is machined from heat treated (HPT)158 Carpenter steel, and is shot peened and magnetic particle inspected (MPI). Additionally, the WMD Nickel Boron BCG is available in the semi and fully automatic models, with or without a hammer certified per Government drawings. All in all, the WMD Bolt Carrier Group offers a cutting-edge coating for high-volume shooters or anyone who will use it in dirty and sandy environments. With minimum or no lubrication, this durable and low maintenance bolt carrier group will make your investment last longer and function smoothly. How to Install BCG on an AR-10? After dropping down the charging handle into the channel inside the upper, then take the BCG with a bolt in its most outwards position and align the gas key with the channel inside the charging handle. Next, push the complete bolt assembly towards the receiver until it locks into position. Finally, assemble the upper and the lower receiver, push in the takedown pins, and your rifle is now complete. Pull your charging handle several times to check if your AR-10 is working correctly and if everything is ok; you are ready for a live test. As with the most of AR parts, it is possible to purchase the components individually or obtain an entire pre-assembled bolt carrier group unit. For first time buyers and fresh AR-builders, it’s more reasonable to start with complete BCG from a renowned manufacturer as this decision will profoundly improve your chances of buying a right Bolt Carrier Group. Besides the barrel, the bolt carrier group is often considered the heart of an AR-rifle. Because of the diversified choices on the market, purchasing the best AR-10 BCG can be a confusing task. While there are BCGs that are professional and general at the same time, there are also specialized units like lightweight bolt carrier groups intended to make top performing results at competitions and ranges. Above all, you should know that most issues with AR's have to do with the BCG, so if you make a wrong selection, your firing experience will be a lot less enjoyable. On the contrary, by selecting the right bolt carrier group for your needs, you will get the best performance out of your AR-10.